The Jisc SSBR Institutional Innovation project conference on Institutional Impact, held last month, featured a series of accompanying internet radio broadcasts produced by Dirk Stieglitz and myself. The radio was also streamed into the Elluminate platform and into the Second Life social event in the evening. The keynote presentation by John Cook was broadcast live, ande radio programmes featured music, interviews and phone in sessions with guests. That I have done and emailed off to George and to Emma Anderson who edits the newsletter. But I thought the ‘reflection’ might be of interest to a wider audience. So here you go…. “The radio show was seen as an experiment and had a number of objectives. One aim was to experiment with mixing different media in an online conference. Different media provide different affordances, and a mix of media can provide a richer online learning environment. However, anecdotal evidence would suggest that participants can be confused by multiple platforms especially when each requires a separate login. The radio programme was streamed through Elluminate allowing easy access, despite offering lower quality than the online internet stream. Although other conferences and events – notably those organised by Webheads – have used internet radio as part of the ‘mix’, as far as we are aware this was the first time internet radio had been streamed through an online platform in this way. A second issue with online conferences is continuity. Experience of previous events suggests that the concentration involved in participating in such events is tiring and that frequent breaks are desirable between sessions. However, with the lack of proximately of co-participants in a shared physical environment, the continuity of the event is lost. The radio programme provided continuity by ensuring there was always something happening, whilst at the same time allowing for less intensive concentration and participation than the regular conference sessions. At the same time the radio was able to offer both a continuity link in terms of the themes of the conference and an opportunity to extend, explore and reflect on those themes through pre-recorded and live interviews with those involved in similar or related projects and initiatives. Whilst parts of the radio broadcasts were streamed into the Elluminate portal, the broadcast also allowed those not registered for the conference (for which registration was limited to Jisc programme participants) to listen to the keynote presentation by John Cook. Although the radio was announced in advance, we suspect that most listeners learnt about the broadcast from Twitter. Although our statistics are limited, it is interesting to note that a considerable number of listeners appear to be from outside the UK and particularly from continental Europe. This could be of potential importance in dissemination or ‘benefits realisation’ for Jisc projects. All the radio broadcasts have been made available after the conference as MP3 podcasts. The podcasts of previous live radio programmes have been relatively popular, usually attracting at least 500 downloads over a six month period. The podcast of last year’s Jisc emerge project live broadcast form Alt C in Leeds has had over 2500 downloads! Getting the feel and atmosphere right for the broadcasts is an ongoing issue. We had a slightly different approach to the different programmes broadcast through the day. The morning programme, prior to the conference was mainly music, with some preview of the days activities. The morning and afternoon coffee break programmes featured Jisc projects and initiatives, whilst the lunch time programme featured interviews with Jisc programme managers. Finally the evening programme was seen as a magazine style ‘wrap-up’ to the day, featuring live interviews with organisers of other UK and European projects as well as providing an opportunity for reflection by the conference organisers. Our broadcasting of music in the radio programmes has proved highly popular, However, it is difficult to choose a mix of music which suits everyone’s tastes. All the music is from the Creative Commons Jamendo web site, meaning that we remain legal whilst at the same time promoting open content. However, this does mean we are unable to play music which is familiar to people and this may be challenging, especially early in the morning! Next time we will try to provide a wider mix of music. In conclusion, we feel the radio was successful, enhancing the conference, providing a showcase for multi channel and multi platform connections and allowing for reflection and continuity in the overall event. 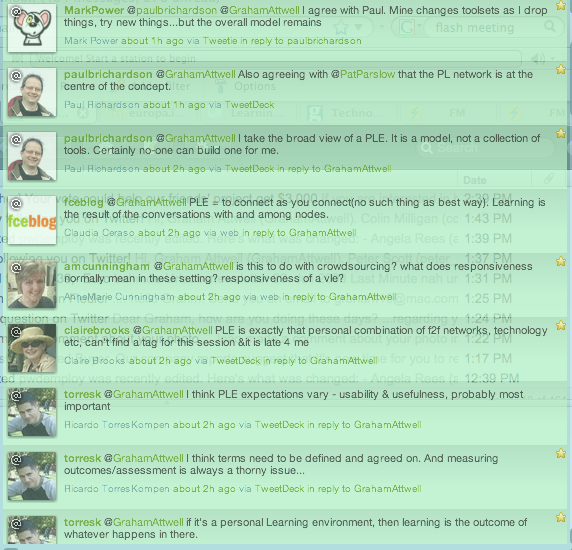 It is heartening to see the increasing interest in Personal Learning Environments. Indeed, in terms of research into Technology Enhanced Learning, it is probably not going too far to say that PLEs have now mainstreamed. However, with increasing research, and especially as developers and practitioners move towards implementing PLEs – or rather implementing an approach to learning based on Personal Learning Networks and PLEs, tensions are emerging. One particular point of tension became very apparent at last weeks ROLE project expert workshop between an approach to personalisation based on a (corporate or institutional) VLE or Learning Management System providing more space for self supported learning and those wishing to empower learners in developing their own learning environment based on social software. A related tension is between seeing learners essentially using PLEs to follow programmes of learning – be they courses or online learning – and those seeing PLEs as primarily a space to reflect on informal learning. And yet a further tension is in the extent to which recommender systems can assist learners in developing their own learner systems. Or is the prime function of a PLE to enable individuals to develop their own networks for peer assisted learning? All these approaches have their strengths and are not mutually incompatible. However with growing numbers of projects aiming to develop, test or implement PLEs, it is becoming important that project partners gain a shared understanding of both the meaning of a PLE and the particular objectives of any project development. I am in Leicester in the UK at a “Personal Learning Environment Expert Workshop organised by the EU ROLE project. In one group activity this morning they asked us to discuss three questions. I twittered the questions and was surprised by the number of replies i received. So I though I would share with you your collective expertise! 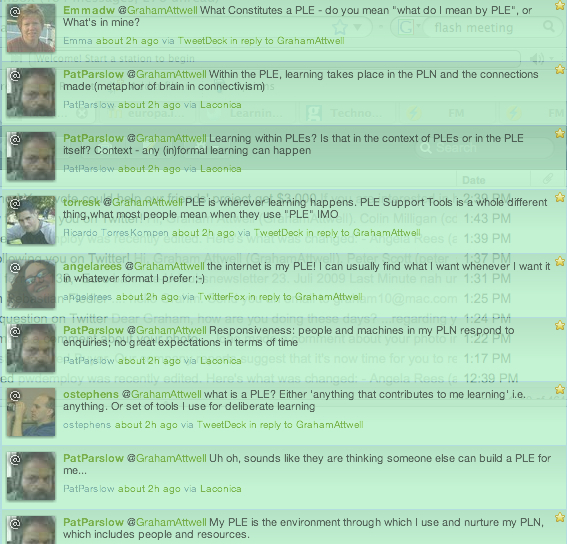 What constitutes as a PLE for you? What constitutes learning ….within PLEs. Are such constituents of learning measurable and how? How do you interpret ‘responsiveness” of a PLE? I had an excellent time yesterday at the UK Becta sponsored Open Source Schools unconference. As always with Open Source events, the energy and enthusiasm of participants was encouraging. But this was not just an event about Open Source. It was about how we can make creative use technologies to promote and support explorative learning. My keynote presentation will be available on video and audio next week, I am told. But one of my main points was that the idea of bricolage, as put forward by Levi Strauss – about how we make creative and resourceful use of whatever materials are to hand – regardless of their original purpose – to learn and to create – applies to the learning environment just as much as to materials, documents, media etc. In other words, in the process of creating, we shape the learning environment, and the outcomes of the process of bricolage will in turn help to reshape the design of the environment. Open Source is valuable because it affords us the opportunities to shape or design its use in the learning process. I was greatly impressed with a demonstration of the Sugar Learning platform – originally developed for the One Laptop per Child XO-1 netbook and now available to run on most computers. The sugar platform, say the developers, promotes collaborative learning through Sugar Activities that encourage critical thinking, the heart of a quality education. Sugar is seen as an alternative to the traditional ‘office- desktop’ software. I am certainly going to have a play with Sugar. I think most of us in the workshop were greatly excited, despite problems we were experienced with the BT network. But what was worrying some of the teachers was just the possibilities of such interfaces for play and exploration. This, they felt, would be wonderful with 6 or 7 year old children. But, sad to tell, the UKs rigid, overcrowded and overly prescriptive curriculum leaves no time for such explorative play. In my last post I included excerpts of a paper I have written looking at the development of a Work Oriented MoBile Learning environment (WOMBLE). One of my main interests in such a system is the ability to support contextual learning in different environments. However that poses the problem of developing a model of context. And, I think, such a model needs to be based on a true ontology, rather than merely developing taxonomical lists of, for instance, different competences. Last night I was discussing this in the pub (a rich contextual environment for learning!) with my friend and colleague Pekka Kamarainen. he came up with the following model – which he calls ‘dimensions of contextual images’ – based on the work of the German sociologist, Ritsert. I am aware that it all sounds a little abstract. But I think such a model could form the basis for an advanced learning design, capable of being implemented through mobile, ambient and context aware devices. Below is the key section of the paper explaining about the environment. And I am also attaching a word file if you wish to download the full paper. As always I would be very interested in any feedback. “Educational technology has been developed within the paradigm of educational systems and institutions and is primarily based on acquiring formal academic and expert sanctioned knowledge. However business applications and social software have been widely appropriated outside the education systems for informal learning and for knowledge development, through social learning in communities of practice. Is it possible to reconcile these two different worlds and to develop or facilitate the mediation of technologies for investigative and learning and developing developmental competence and the ability to reflect and act on the environment? Based on the ideas of collaborative learning and social networks within communities of practice, the notion of Personal Learning Environments is being put forward as a new approach to the development of e-learning tools [25,26]. In contrast to Virtual Learning environments, PLEs are made-up of a collection of loosely coupled tools, including Web 2.0 technologies, used for working, learning, reflection and collaboration with others. PLEs can be seen as the spaces in which people interact and communicate and whose ultimate result is learning and the development of collective know-how. A PLE can use social software for informal learning which is learner driven, problem-based and motivated by interest – not as a process triggered by a single learning provider, but as a continuing activity. The ‘Learning in Process’ project  and the APOSDLE project  have attempted to develop embedded, or work-integrated, learning support where learning opportunities (learning objects, documents, checklists and also colleagues) are recommended based on a virtual understanding of the learner’s context. While these development activities acknowledge the importance of collaboration, community engagement and of embedding learning into working and living processes, they have not so far addressed the linkage of individual learning processes and the further development of both individual and collective understanding as the knowledge and learning processes mature . In order to achieve that transition (to what we term a ‘community of innovation’), processes of reflection and formative assessment have a critical role to play. Critically, mobile devices can facilitate the recognition of context as a key factor in work related and social learning processes. Cook  proposes that new digital media can be regarded as cultural resources for learning and can enable the bringing together of the informal learning contexts in the world outside the institution with those processes and contexts that are valued inside the intuitions. Instead he argues for the scaffolding of learning in a new context for learning through learning activities that take place outside formal institutions and on platforms that are selected by learners. Cook  describes two experimental learning activities for mobile devices developed through projects at London Metropolitan University. In the first, targeted at trainee teachers an urban area close to London Metropolitan University, from 1850 to the present day, is being used to explore how schools are signifiers of both urban change and continuity of educational policy and practice. The use of the mobile technology allowed the development and exploration of boundary objects transcending the physical and virtual worlds. Boundary objects have been defined as “objects which are both plastic enough to adapt to local needs and constraints of the several parties employing them, yet robust enough to maintain a common identity across sites. They are weakly structured in common use, and become strongly structured in individual-site use. They may be abstract or concrete. They have different meanings in different social worlds but their structure is common enough to more than one world to make them recognizable means of translation. The creation and management of boundary objects is key in developing and maintaining coherence across intersecting social worlds.” . The creation and management of boundary objects which can be explored through mobile devices can allow the interlinking of formal and academic knowledge to practical and work process knowledge. Practically, if we consider models for personalized and highly communicative learning interaction in concert with mobile devices, whilst employing context aware techniques, startling possibilities can arise. For example, we can combine the immediacy of mobile interaction with an emergent need for a collaborative problem solving dialogue, in vivo, during everyday working practices, where the contextual dimensions can constrain and structure (through semantic operations) the choices about a suitable problem solving partner or the type of contextualised knowledge that will support the problem solving. In brief, combining dialogue design, social software techniques, mobility and context sensitivity means we have greater opportunities for learning rich dialogues in situations where they are needed – to address concrete and emergent problems or opportunities at work. Such approaches to work oriented mobile learning also supports Levi Strauss’s idea of bricolage . The concept of bricolage refers to the rearrangement and juxtaposition of previously unconnected signifying objects to produce new meanings in fresh contexts. Bricolage involves a process of resignification by which cultural signs with established meanings are re-organised into new codes of meaning. In such a pedagogic approach the task of educators is to help co-shape the learning environment. Of course, such approaches are possible using social software on desktop and lap top computers. The key to the mobile environment is in facilitating the use of context. This is particularly important as traditional elearning, focused on academic learning, has failed to support the context based learning inherent in informal and work based environments. Social networking research – are we missing the point? “As Matthew Robson describes, most teenagers use a variety of digital devices, but when you talk to people who work with teenagers they describe a much more complex picture of what they actually do. The same teenagers who have literacy problems have media literacy problems. Many of the teenagers apparently comfortable with new media are in fact only using a very limited range of applications and in a very limited way. But I can’t help thinking many of these researchers are missing the point, possibly because of who is sponsoring their work. The research seems often to focus on the degree of interest, engagement, activity or time spent on particular social networking sites or applications. In other words, it is looking at the degree of participation in an approved manner in what is being provided for them. And often the studies seem to disconnect engagement with social networking sites from the rest of the person’s life. What I suspect is really happening is that people are appropriating technologies and applications to integrate them in their studies or work or in their social life. In so doing they are using the technologies in ways which suit them, not necessarily in the way that the applications were designed to be used. And in the process the technology ceases to be a focus in itself, it is just part of everyday living. From a research point of view it would be more interesting to look at how our work and social activities are changing as technology becomes increasingly embedded in our lives, rather than focusing on the use of particular applications or services. Posted in Social networking, Social Software, Wales Wide Web | Comments Off on Social networking research – are we missing the point? Last week we hosted a series of radio shows to accompany the Jisc SSBR Institutional Innovation project conference on Institutional Impact. And here are the podcasts. The lunchtime programme features interviews with Jisc programme managers, Lawrie Phipps and Ruth Drysdale. The afternoon show has an interview with Howard Noble from the Green ICT project. Dirk Stieglitz selected the music, produced the programme and undertook the post programme processing. My thanks to Dirk and all my guests for making a great series of programmes.